Roy Sorsdahl was born circa 1914 at Saskatchewan, Canada. He was the son of Otto A. Sorsdahl and Gurine Emelie Solem. 1916 Weyburn, Saskatchewan, Canada Roy Sorsdahl appeared on the census of 1916 in the household of Otto A. Sorsdahl at Weyburn, Saskatchewan, Canada. Carl Sorsdahl was born circa 1916 at Saskatchewan, Canada. 1916 Weyburn, Saskatchewan, Canada Carl Sorsdahl appeared on the census of 1916 in the household of Otto A. Sorsdahl at Weyburn, Saskatchewan, Canada. John Milton Toffelmire was born in March 1857 at Arkansas. He was the son of Benjamin Franklin Toffelmire and Sarah (?). John Milton Toffelmire married Sarah Ellen Mullineaux, daughter of Thomas Mullineaux and Clarissa Ellen Buckley, on 30 March 1892 at Aurora, Lawrence, Missouri. John Milton Toffelmire was buried in 1905 at Blue Lick Cemetery, Blue Lick, Saline, Missouri. He died in 1905 at Saline, Missouri. [S248] U.S. Federal Census 1860 U.S. Federal Census, by Ancestry.com, Year: 1860; Census Place: Wallace, Benton, Arkansas; Roll: M653_37; Page: 275; Image: 277; Family History Library Film: 803037. [S245] U.S. Federal Census 1900 U.S. Federal Census, by Ancestry.com, Year: 1900; Census Place: Salt Fork, Saline, Missouri; Roll: 902; Page: 3A; Enumeration District: 0138; FHL microfilm: 1240902. Martin Wesley Toffelmire was born on 3 February 1894 at Saline, Missouri. He was the son of John Milton Toffelmire and Sarah Ellen Mullineaux. Martin Wesley Toffelmire married Arletta Smith, daughter of Sterling Price Smith and Debbie Ella Yates, after June 1917. He was buried after 9 March 1962 at Ridge Park Cemetery, Marshall, Saline, Missouri. Martin Wesley Toffelmire was a plumber in June 1917. On 5 June 1917 at World War I Draft Registration, Marshall, Saline, Missouri. [S250] U.S. Federal Census 1930 U.S. Federal Census, by Ancestry.com, Year: 1930; Census Place: Marshall, Saline, Missouri; Roll: 1246; Page: 9B; Enumeration District: 0020; Image: 922.0; FHL microfilm: 2340981. 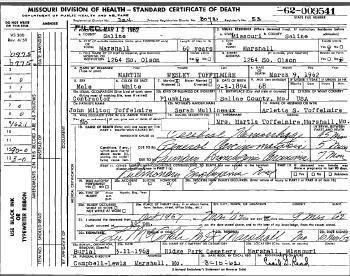 [S373] U.S. Federal Census 1940 U.S. Federal Census, by Ancestry.com, Year: 1940; Census Place: Marshall, Saline, Missouri; Roll: T627_2155; Page: 18A; Enumeration District: 98-24. Johnny Toffelmire was born in 1896 at Saline, Missouri. Johnny Toffelmire died before 1900. Martha Jane Toffelmire was born in May 1898 at Saline, Missouri. She was the daughter of John Milton Toffelmire and Sarah Ellen Mullineaux. Martha Jane Toffelmire was buried in 1910 at Blue Lick Cemetery, Blue Lick, Saline, Missouri. Name Variation Gertrude Viola Toffelmire was also known as Smith surname of step-father. Name Variation Gertrude Viola Toffelmire was also known as Viola. Gertrude Viola Toffelmire was born on 6 March 1901 at Saline, Missouri. Gertrude Viola Toffelmire died on 22 June 1924 at Saline, Missouri, at age 23. She was buried after 22 June 1924 at Blue Lick Cemetery, Blue Lick, Saline, Missouri. [S244] U.S. Federal Census 1910 U.S. Federal Census, by Ancestry.com, Year: 1910; Census Place: Blackwater, Saline, Missouri; Roll: T624_823; Page: 3B; Enumeration District: 0162; FHL microfilm: 1374836. Name Variation Sterling Price Smith was also known as S. P.
Sterling Price Smith was born on 7 July 1864 at Illinois also reported as Jul 1863. He was the son of William M. Smith and Mary Ballard. Sterling Price Smith married Debbie Ella Yates on 4 October 1894 at Marshall, Saline, Missouri. Sterling Price Smith married Sarah Ellen Mullineaux, daughter of Thomas Mullineaux and Clarissa Ellen Buckley, circa 1906 at second for him. Sterling Price Smith died on 9 June 1929 at Saline, Missouri, at age 64. He was buried after 9 June 1929 at Blue Lick Cemetery, Blue Lick, Saline, Missouri. [S245] U.S. Federal Census 1900 U.S. Federal Census, by Ancestry.com, Year: 1900; Census Place: Marshall, Saline, Missouri; Roll: 902; Page: 1B; Enumeration District: 0135; FHL microfilm: 1240902. Name Variation Arletta Smith was also known as Oraletta. Married Name after June 1917 As of after June 1917,her married name was Toffelmire. Arletta Smith was born on 25 September 1897 at Missouri also reported as Sep 1896. She was the daughter of Sterling Price Smith and Debbie Ella Yates. Arletta Smith married Martin Wesley Toffelmire, son of John Milton Toffelmire and Sarah Ellen Mullineaux, after June 1917. Arletta Smith died on 19 March 1987 at age 89. She was buried after 19 March 1987 at Ridge Park Cemetery, Marshall, Saline, Missouri. Name Variation Debbie Ella Yates was also known as Ella. Married Name 4 October 1894 As of 4 October 1894,her married name was Smith. Debbie Ella Yates was born in August 1860 at Tennessee. She married Sterling Price Smith, son of William M. Smith and Mary Ballard, on 4 October 1894 at Marshall, Saline, Missouri. Debbie Ella Yates died in 1903 at Saline, Missouri. Mary Bessie Smith was born in July 1894 at Missouri. Mary Bessie Smith died in 1980 at Kansas City, Jackson, Missouri. Mamie Smith was born in 1903 at Missouri. Oliver Price Smith was born on 14 September 1907 at Marshall, Saline, Missouri. He was the son of Sterling Price Smith and Sarah Ellen Mullineaux. Bessie Smith was born circa March 1910 at Missouri. She was the daughter of Sterling Price Smith and Sarah Ellen Mullineaux. William M. Smith married Mary Ballard. Mary Ballard married William M. Smith. Married Name Her married name was LaGore. Name Variation Catherine Isabel Toffelmire was also known as Kaky. Name Variation Catherine Isabel Toffelmire was also known as Katherine. Catherine Isabel Toffelmire married Russell Robert LaGore. Catherine Isabel Toffelmire was born on 12 November 1915 at Missouri. She was the daughter of Martin Wesley Toffelmire and Arletta Smith. Catherine Isabel Toffelmire died in May 1973 at age 57. Name Variation Mary Frances Toffelmire was also known as Frannie. Married Name 26 July 1942 As of 26 July 1942,her married name was Ridge. Mary Frances Toffelmire was born on 26 February 1921 at Shamrock, Oklahoma. Mary Frances Toffelmire married Charles Herbert Ridge on 26 July 1942. Mary Frances Toffelmire died on 20 June 2014 at Marshall, Saline, Missouri, at age 93 Mary Frances (Frannie) Ridge, 93, of Marshall, MO, died Friday, June 20, 2014, at The Living Center in Marshall. Born February 26, 1921, in Shamrock, Oklahoma, Frannie was the daughter of the late Martin W. Toffelmire and Arletta Smith Toffelmire. On July 26, 1942, she married Charles Herbert (Herb) Ridge who preceded her in death on November 2, 2008. She lived in Marshall most of her life where she was a member and very involved in Community of Christ Church. Survivors include one daughter, Melissa Ridge of Richmond, CA; one grandson, Holden Ridge; and numerous nieces and nephews. In addition to her parents and husband, Frannie was preceded in death by two sisters, Catherine LaGore and Helen Shepherd. She was buried after 20 June 2014 at Ridge Park Cemetery, Marshall, Saline, Missouri. Married Name Her married name was Shepherd. Helen Marie Toffelmire married (?) Shepherd. Helen Marie Toffelmire was born on 31 May 1923 at Marshall, Saline, Missouri. Helen Marie Toffelmire died on 8 November 2012 at Vanderburgh, Indiana, at age 89 Helen Shepherd, 89, of Evansville, passed away at 3:35 p.m. Thursday, November 8, 2012, at Good Samaritan Home. Helen was born May 31, 1923, in Marshall, Missouri, the daughter of Martin and Arletta Toffelmire. She was a 50-year member of Centenary United Methodist Church. Helen worked until age 76, when she retired from Marian's Card and Gifts at Town Center Mall. She was a member of Scott Township Home Economics Club.She is survived by daughters, Penny Johnson (Mark Cook) and Barbara Jane Shepherd, both of Evansville; son, Thomas Andrew Shepherd (Mary Beth Ennulat), of Evansville; sister, Mary Frances Ridge, of Marshall, Mo; and grandchildren, Scott Shepherd, Zachary Johnson and Alex Johnson. She was preceded in death by her sister, Katherine "Kaky" LaGore.Funeral services will be held at 1 p.m. Monday, November 12, 2012, at Boone Funeral Home East Chapel - 5330 Washington Avenue, with Pastor Daniel Walker officiating. Burial will be in Park Lawn Cemetery. Friends may call from 10 a.m. until service time at 1 p.m. Monday, November 12, 2012, at Boone Funeral Home - East Chapel. Memorial Contributions may be made to: Centenary United Methodist Church, 14340 Old State Rd., Evansville, IN 47725. Name Variation Charles Herbert Ridge was also known as Herb. Charles Herbert Ridge was born on 30 December 1913. He married Mary Frances Toffelmire, daughter of Martin Wesley Toffelmire and Arletta Smith, on 26 July 1942. Charles Herbert Ridge died on 2 November 2008 at age 94. Russell Robert LaGore married Catherine Isabel Toffelmire, daughter of Martin Wesley Toffelmire and Arletta Smith. Russell Robert LaGore was born in 1911 at Missouri. (?) Shepherd married Helen Marie Toffelmire, daughter of Martin Wesley Toffelmire and Arletta Smith. Robert Martin LaGore was born on 23 January 1943 at Marshall, Missouri. He was the son of Russell Robert LaGore and Catherine Isabel Toffelmire. Robert Martin LaGore died on 26 June 2010 at Jefferson, Missouri, at age 67 Robert M. LaGore, 67, of Imperial, MO, formerly of Marshall, died Saturday, June 26, 2010, at St. Anthonys Medical Center in St. Louis, MO. Memorial graveside services will be held at 11:30 a.m. Friday, February 25, 2011 at Ridge Park Cemetery in Marshall, with Norman LaGore officiating. Memorials may be made to family choice in care of Campbell-Lewis Funeral Home in Marshall. Born January 23, 1943, in Marshall, he was the son of the late Russell R. LaGore and Catherine Toffelmire LaGore. He was a 1961 graduate of Marshall High School. In June of 1987, he married Sherry Coates who preceded him in death. He was a retired truck driver and construction worker. Survivors include his children, Kathryne Harris of Marshall, Khristopher LaGore of Marshall, Kristina Cook of Norborne, MO, Angie Rogers of Slater, MO, Heather Dial of Rolla, MO and Bobby LaGore of St. Louis, MO; eight grandchildren; one brother, Phil LaGore of rural Marshall; three step-sons, Mike, Steve and Adam Coates; and two nephews. In addition to his parents and wife, he was preceded in death by two children in infancy, Rusty and Lawrence LaGore. Name Variation Benjamin Franklin Toffelmire was also known as B. F.
Benjamin Franklin Toffelmire married Sarah (?). Benjamin Franklin Toffelmire was born on 8 March 1831 at Ontario, Canada. He died on 29 March 1909 at Benton, Arkansas, at age 78. Married Name Her married name was Toffelmire. Sarah (?) married Benjamin Franklin Toffelmire. Sarah (?) was born circa 1831 at Tennessee. William Toffelmire was born circa 1853 at Arkansas. Fred Nunn married unknown (?). Fred Nunn was born circa 1884 at Missouri. [S373] U.S. Federal Census 1940 U.S. Federal Census, by Ancestry.com, Year: 1940; Census Place: Sedalia, Pettis, Missouri; Roll: T627_2139; Page: 6A; Enumeration District: 80-23. Married Name Her married name was Nunn. Unknown (?) married Fred Nunn. Unknown (?) died before 1940. Married Name Her married name was Burke. Dorothy Mullineaux married Tom Burke. Dorothy Mullineaux was born circa 1928 at Missouri. She was the daughter of Charles Cecil Mullineaux and Frances Ellen Nunn. Dorothy Mullineaux died in 1992. [S250] U.S. Federal Census 1930 U.S. Federal Census, by Ancestry.com, Year: 1930; Census Place: Sedalia, Pettis, Missouri; Roll: 1218; Page: 2B; Enumeration District: 0022; Image: 168.0; FHL microfilm: 2340953. Married Name before 1968 As of before 1968,her married name was Strattman. Married Name April 1968 As of April 1968,her married name was Shultz. Helen Virginia Mullineaux was born on 21 September 1931 at Sedalia, Pettis, Missouri. Helen Virginia Mullineaux married (?) Strattman before 1968. Helen Virginia Mullineaux married Thomas Eugene Shultz in April 1968 at St Johns, Florida. 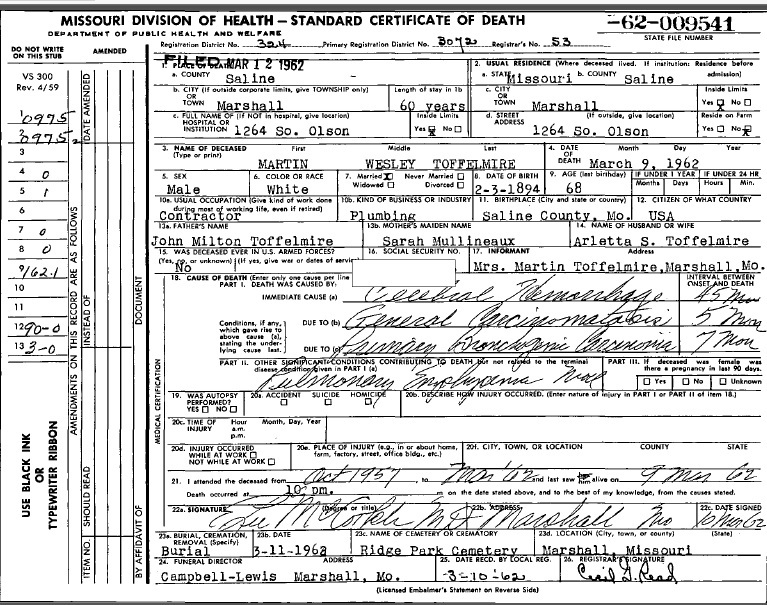 Helen Virginia Mullineaux died in May 1984 at age 52 also reported as 1983.